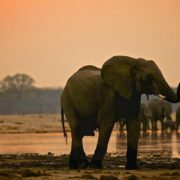 As many of you know, I recently returned from an epic safari to Zambia and Zimbabwe with two guests from Cochrane. I am happy to announce we all returned alive 🙂 but even better, my two new friends, Sing and Theresa Lai, are totally hooked on Africa! As we left Calgary in the last week of March, we left a scattering of snow behind and were greeted in Johannesburg by a wonderfully warm 24 degrees at 10pm that first night. After a good nights rest and a scrumptious buffet breakfast, we headed back to the airport for our flights north to Mfuwe in Zambia. John, one of the drivers for Robin Pope Safaris, greeted us at the airport and suddenly the excitement was tangible as our safari was taking us through colourful villages and thick tropical bush on to the Luangwa River where we would hop on a boat and explore one of my favourite and one of the wildest areas left in Zambia over the next 7 days. 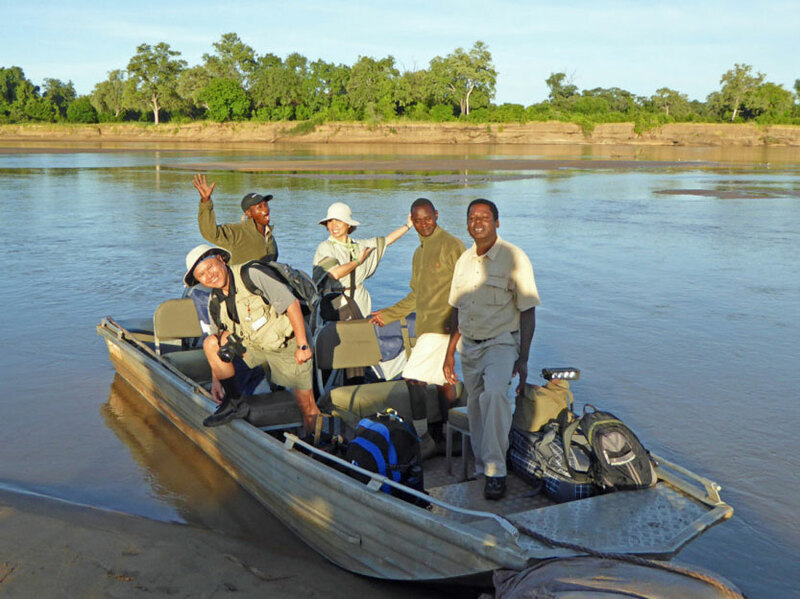 At the main entrance to Luangwa National Park, our guide Sebastian was waiting for us and we quickly loaded our bags onto his safari vehicle – an open Land Rover. Night had fallen and we were enveloped by the thick heady scent of wild jasmine mixed with potato bush.. The night was alive with crickets, frogs, tiny little owls hooting and impala darting for cover as our spotlight caught glimpses of them. I was in heaven. This was home. A river crossing in a small metal boat is quite a daunting adventure in the dark as one has no idea of the surrounding landscape or the amount of hippos and crocs in the water! 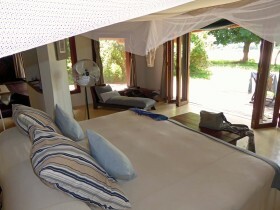 Very soon we arrived at Luangwa River Lodge, our home for the next three nights. River Lodge is perfectly positioned on the banks of the mighty Luangwa so one has the most sensational view from anywhere in camp – your bed, the pool, the bar and of course the breakfast table at 6am in the morning when the first rays of a new day is painting the river rosy. The rooms are beautifully dressed in muted plums, blues and khakis and the beds are romantically draped with large white mosquito nets. Large en suite bathrooms, flush loos, double vanity’s, high pressure showers and a bath with a view complete the feeling of bush luxury. As the river was unseasonably low, we were not able to do our game viewing by boat as I had planned due to a shortage of rains. 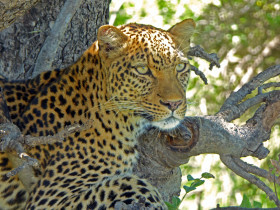 This was not a bad thing at all as on our drives we saw large amounts of elephants, zebra, impala, puku, baboons, wild dogs, lions, leopard, warthog and a dazzling variety of brightly coloured summer birds which Theresa ended up loving! On day 4 we had to change our plans slightly as one of the camps were inaccessible by river so we were offered the opportunity of bush camping! 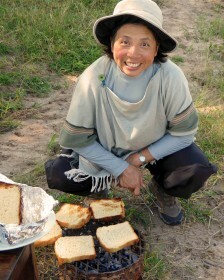 Bush camping is an adventurous experience in itself. Your tent is made comfy with a plush mattress and cotton linen, a side table with a range of amenities and outside you have your seating area and a canvas basin with hot water delivered every morning to wash your face. Decadent! The loo is eco friendly and the shower is a hot water bucket contraption that gets delivered on your command. 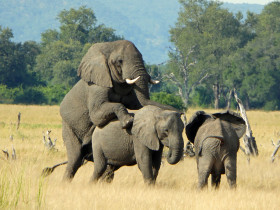 What more could one want on a camping safari? Sing is starving and ready to devour a sausage pod! A mini library and full bar is setup under a Feverberry tree, the dining room table has a view of the river and the food is delicious – with bread freshly baked in a hole in the ground! We arrived in time for a sensational lunch and of course a siesta was necessary thereafter as it was a hot 34 degrees and we were wilting. Our adventure was interrupted by a spectacular rainstorm that afternoon that totally drenched not only our camp but the surrounding roads too. After we all huddled in my tent and told stories with our guide, all that was left to do was to pack up and move on to Nkwali camp where we would spend our last 4 nights. We managed exactly four hours of bush camping. For what it was worth, it was wonderful while it lasted! Our days at Nkwali were spent with a young and enthusiast guide, Kanga. We were treated to some exceptional wildlife sightings of mating elephant one morning as well as a journey of giraffe that were so close to our car that we could almost reach out and touch them. We went on a walk to stretch our legs and came across spittle bugs, a teeny tiny forgotten Blue Waxbill egg in a nest and had many lessons in tracking and the smaller details of the bush. Nkwali camp is nestled underneath some large Jackalberry trees and overlooks another spectacular stretch of the Luangwa. There is a large deep pool to cool down in and wake up calls and meals are announced by the talented camp drummer, beating away on a traditional wooden drum with a cowhide cover. The spacious and comfortable rooms are semi-open and the double showers are open to the skies – I shared mine with a small rain frog every night. 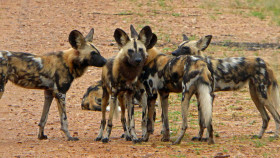 Endangered species – a pack of 15 wild dogs which we were fortunate to spend over an hour with! As the camps are not fenced, wildlife can move freely as was evident by the fresh leopard tracks down our pathway one morning. 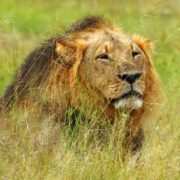 Three lioness caught a warthog on the lawn in the early hours of the morning and hyena’s typically were heard whooping through the night. Victoria Falls was next on our list and is surely one of my favourite towns in Africa. A pretty little spot with flowering Frangipani and Flamboyant trees lining the main road. 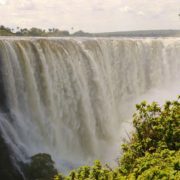 Look down the street and you see the enormous white cloud above the falls that is the mist from the spray – no wonder the national park is called “Mosi oa Tunya” the smoke that thunders. The Victoria Falls Hotel is a grand old lady in a beautifully kept colonial style and we loved our experience here as not only are the service levels very high but it is the people that make one feel so at home that I love most. Walking through town one day we stopped in at many little shops looking for unique crafts and Sing fell in love with a very special hand carved walking stick that tells the story of the elusive ‘nyami nyami’ river god that some locals believe live in the Zambezi river. Theresa was enamoured with the local fabrics and I am a sucker for baskets and carvings so it is easy for me to spend money on those – especially as I know that the money really helps to put food on the basket sellers table..
We walked the full length of the famous falls and got showered by the mist, a necessary part of the experience as I call this the ‘Zambezi blessing’ and one should not leave Africa without letting her touch you in some way or another. We dined at an African restaurant where we sampled various cuts of venison and Sing was brave enough to sample the local delicacy – Mopani worms! Our final evening was spent cruising the river on a luxury yacht while enjoying some delicious canapes. Elephants were swimming in the river and the hippos honked their final goodbyes to wish us a safe return. Sing, Theresa and I parted ways in Johannesburg as they went on to spend another 5 nights in the Cape and had a glorious time sightseeing and enjoying the delicious food the Cape is known for. I had such a wonderful safari with these two lovely people and I look forward to hosting them in another special part of Africa one day. There’s no denying it.. Africa is addictive! 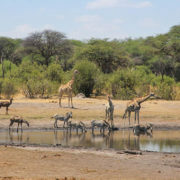 Have a look at our Escorted Safaris page and then give us a call, we will help to make your safari dreams come true too. Africa, I’d love to have lunch with you again sometime and enjoy another visit. As first timers to Africa, we were certainly well looked after by Antoinette and Explorations Africa. The camps are exceptionally comfortable and the wild lifes amazing. We were well aware that during the Emerald season, the wild lifes are not as concentrated to the water holes but we managed to see all that we wanted to see. The guides are very experienced in looking for the animals, very knowledgeable in their habitates and very courteous in looking after our needs. Victoria Falls are truly amazing with a width of over 1.7 km of thunderous water cascading 100 m into a narrow gorge. We would love to re-visit both the safari and the falls during the dry season and experience the other aspects of the land.